The Hammonds are back in Santa Clarita Diet season three and they bring with them a host of familiar faces (and a couple of new ones) as they try to juggle the day-to-day chaos of undead living with some big-picture revelations that they so far hadn’t had much time to consider. The end result is a sometimes laugh-out-loud funny, sometimes poignant, but always entertaining third installment. The third season picks up in the immediate aftermath of Sheila’s (Drew Barrymore) miracle in the desert that caused sheriff’s deputy Anne (Natalie Morales) to start worshipping our undead heroine as an instrument of God. That was a clever way to wrap up the Anne Problem in season two, but of course, now it isn’t as simple as Anne deciding Sheila is a holy crusader and leaving her alone to smite bad guys. The new Anne Problem is that she has gone from being increasingly suspicious of Sheila and Joel (Timothy Olyphant) to being a Sheila disciple, which brings with it a whole host of other problems, even if there are some perks to having a sheriff’s deputy as your biggest fan. Meanwhile, Joel has his hands full with the reappearance of Ron (Jonathan Slavin), his buddy from the psychiatric unit who wants Sheila to turn him undead, and Abby (Liv Hewson) and Eric (Skyler Gisondo) are up to their eyeballs in their own problems when the FBI is called in to investigate the explosion at the fracking site. Complicating matters are the Knights of Serbia still trying to kill Sheila, plus a new villain in the form of Poplavic (Goran Visnjic), a member of the Serbian consulate whose exact plan and motives are kept under wraps for most of the season. The Hammonds are also trying to get their budding realty business off the ground, which is a thread the show doesn’t just forget about. It allows for some great scenes featuring rival realtors Chris and Christa (Joel McHale and Maggie Lawson) and Gary the Head (formerly Nathan Fillion, now voiced by Alan Tudyk), who finds new purpose in life thanks to Hammond Realty. Overall, it’s a lot like the first two seasons—the Hammonds are facing threats and crises on multiple fronts, putting their familial bonds to the test. The similarity to the first two seasons isn’t necessarily a negative because if you’re watching season three, you obviously enjoyed the first two seasons enough to stick with the show. What season three adds that makes the show feel a little deeper than in the first two seasons are some big-picture questions. 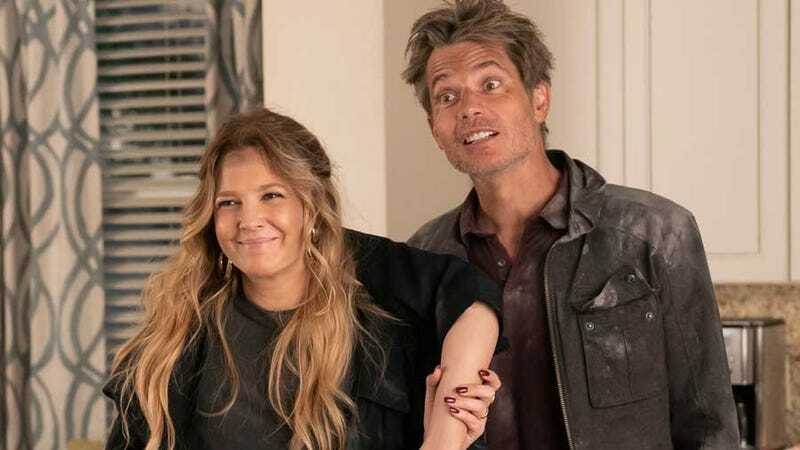 Thanks to the writing and Barrymore and Olyphant’s performances, Sheila and Joel’s marriage has always been of the best on TV; the real-life problems they faced were given a fresh, comedic twist by this supernatural premise. But in season three, they face what might be their first real test when they realize that Sheila is going to live forever and Joel is not. Now, it’s easy to grumble about how it took them so long to come to this realization until you remember it’s only been about a month since Sheila turned and they’ve had their hands a bit full ever since. So when this hits home for the Hammonds, Joel is suddenly faced with a big decision: Become undead like his wife or grow old and die (provided they can survive long enough for Joel to even grow old). Sheila feels like it should be a no-brainer for Joel, and the part about wanting to be with Sheila forever is a no-brainer. But Joel also has some legitimate concerns about turning—what will it do to him and his personality?—and whether he and Sheila can actually be together for all eternity. He posits some deep concerns about the nature of love and Sheila begins to understand his hesitation, even if it still hurts her feelings. That strain might be the biggest problem their marriage has faced so far and it’s nice to see them grapple with such a huge issue. The Hammonds also find themselves still struggling with how to parent Abby in the midst of new lives; it is becoming increasingly obvious they either need to send her away or let her all the way in. This halfway solution has put Abby in serious danger while also leaving her alone to get into her own trouble. Season three finally forces the Hammonds to face the reality of how much Abby has fallen by the wayside since Sheila turned. They find an interesting solution to keeping Abby involved that should also help keep her safe—the bottom line is that both situations give the show some meaty material to explore, which is a solid addition to the daily chaos. Combined with reliably sharp writing and the actors’ comedic timing, it all makes for an immensely watchable show, even in its third season.